This is TO DIE FOR! I may never be able to eat regular mac and cheese again. Seriously! This is the best mac & cheese I've ever eaten. I made this to go with the fabulous steaks we had at my parent's house. Everyone enjoyed it. This is comfort food at its best. Chicken Legs claims to dislike gnocchi, but he loved this dish. We ate this again last weekend. I have a feeling this will be at the dinner table often! Combine Gruyere and fontina, then add by the handful to milk mixture, stirring until melted before adding the next handful. Once all cheese is melted, add basil, salt and pepper. 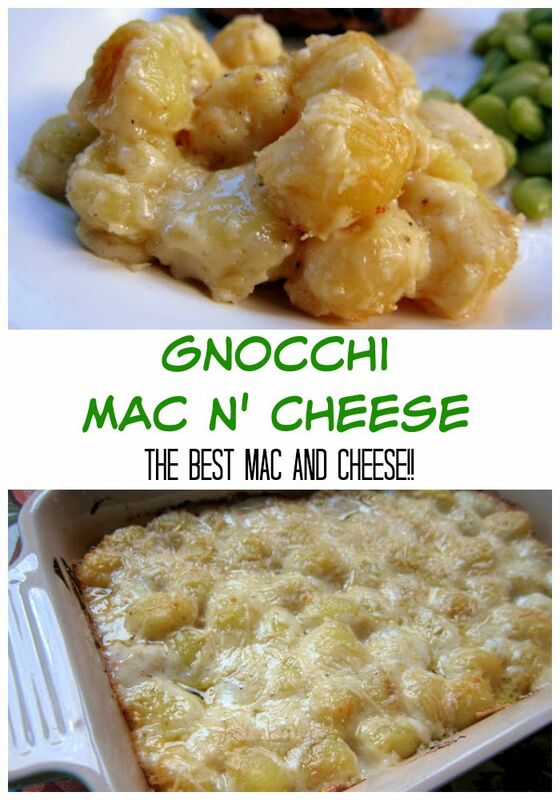 ok, I LOVE gnocchi, and I love mac and cheese - I definitely have to make this! I've been meaning to make gnocchi again recently so this is perfect timing! Came over from Nibble Me This because I saw the title of your post! Oh my....is that gnocchi mac n cheese just glorious! It looks heavenly. Thanks for sharing. Okay, this is what I needed. I have a package of gnocchi that's sitting on the shelf. The picky eater (my husband) wouldn't eat any from the other package when I cooked it. And I had to eat it all by myself. So I'm thinking your great recipe will win him over towards helping to eat the one of the shelf. Great recipe. I'll add it to my growing list of things to make. Sigh. What a great idea! I love gnocci and have never seen them made this way before. I've gotta try this one! What a wonderful idea! It looks SO good! I dont' care for gnocchi but anything covered in that much cheese hs no choice but to be good! Now I wish I had a package of gnocci in my pantry. Love that mixture of cheese! WOW. This was so, so delicious. I may never go back to regular mac & cheese either. Thanks! Woman, what are you doing to us? I'm truely afraid to try this, it looks and sounds sooo comforting! Okay, I've already got the cheese just need the gnocchi! Looks incredible. I have two packs of gnocchi in the pantry that have just been sitting there. Now they have a home! Saving to try soon, thanks Steph! Made this tonight! It was amazing, rich, and comforting! Thanks for sharing. I live in a small town and can not find the fontina cheese and will be lucky to even find the gruyere. Any cheeses you could substitute? Lindsey - you could substitute Swiss for the gruyere and Parmesan for the fontina. That will be really close to the original. Whoever came up with combining gnocchi with cheese was a genious! This one is wonderful! i made this last night and it was absolutely delicious! my husband and i both loved it! i will definitely be making this again thank you! In the middle of making homemade gnocchi to make this dish. Excited and I'm sure it's going to be delicious! OMG!! To die for and Jenny Craig is screaming at me...""NO............"""
And I keep saying just once! I tried this last night. I was a little disappointed in how it turned out, but I'm pretty sure I used too big of a pan. I'm going to try it again and use an 8x8 pan instead of the 9x13. I've never left a review on any website, ever, but I made this a couple of weeks ago and just had to post this. I usually buy a package of gnocchi and pour some alfredo sauce on it, but I decided to give this a whirl. TO DIE FOR. Absolutely amazing! I didn't use the gruyere because I didn't feel like spending 16 bucks on cheese, and I couldn't find fontina, so I ended up using smoked cheddar from the deli section. This was the best mac & cheese AND the best gnocchi ever! Thank you!